This 'command' set supplies all the specialist figures that might be needed, and is meant to be used in conjunction with the sets that have the main infantry poses, which are marching and in action. The first figure is an NCO, in typical drill stance, and the next is a sapper. This is a terrific little figure, with a separate right arm so his axe can be properly done, as well as a separate knapsack to improve the standard of detail. The result is excellent, and with almost no effort he could easily be used for line regiments also, as he wears a bearskin. Beside him is a nice cornet, which is an additional figure for the HaT voltigeurs as chasseurs generally only had drummers. However there were some chasseur cornets, so a suitable head swap would be all that is needed to convert him. The fourth figure is the drummer, again a very nice figure with a separate drum although as the drum is basically on the hip we were not sure why having it separate was necessary. He has his drumsticks out but would not be beating his drum when it is in that position, and we would have preferred the drum to be on the thigh, although as it is already separate some might like to move it there anyway. The last figure in the row is the eagle-bearer. His staff is a separate piece which must be glued in place, and as can be seen he has no flag. In fact the eagle was the most important item, and was often carried without the relatively unimportant flag, as here. Of course the customer can choose to add a paper flag, and many do, so the absence of a flag is not a problem. It should be noted however that during this period light infantry were ordered to keep their eagles at home when going on campaign, though it is likely some ignored this order. The second row contains the officers. First we have a dismounted officer in fairly classic pose, which is nicely done apart from the very short sword which he is holding. The mounted officer is superb, and comes with a choice of right arms, either resting his sword on his shoulder (as we have chosen) or holding his sword out (which can be attached at any angle). The fit is good and the variety of arm poses is excellent. We were particularly pleased with this figure because so often manufacturers forget, or choose to forget, that officers usually advanced into battle mounted, so this figure has many uses. We were not so sure about the anatomy of his horse, but it will do and he fits it well, while all the saddle furniture is authentic. Apart from the voltigeur and the sapper all these figures have the classic shako which was introduced from 1806, and the habit-veste that only began to be replaced after 1812, so these figures are appropriate for these six years. Everything about their uniform is correct, and has been very nicely done. The plumes and diamond plate are at the front of the shako, the habit-veste is fine and they wear breeches tucked into gaiters shaped to resemble hussar boots. The mounted officer is correctly shown wearing riding boots, and both officers wear gorgets. With full shako cords, plume etc. these men are in their finest uniforms, with no hint of any kind of campaign dress such as trousers or the surcoat that officers often wore in the field. Everything is accurate, although in reality their appearance on campaign could have been much less impressive (particularly in Spain and Russia). 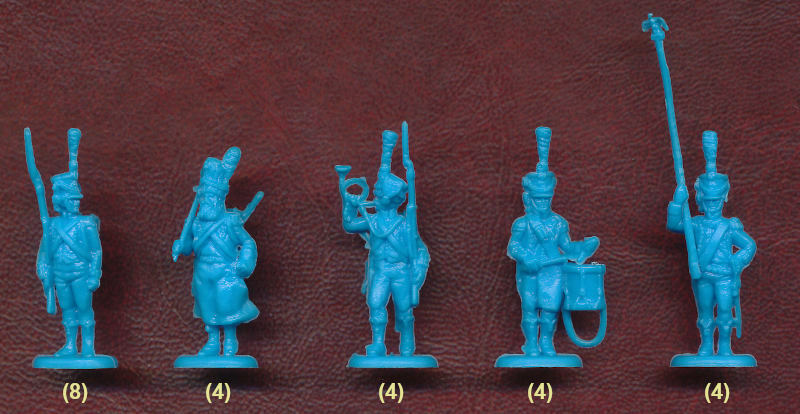 As with all the sets of HaT light infantry the sculpting is very good indeed, with good clear detail and no flash. Where appropriate the men have a peg on their backs onto which the separate packs must be attached, and this join is so well done that it stays without gluing (although gluing is still recommended). Also the separate arms, which will require gluing, fit remarkably well given the small area available. The splitting of this subject across three sets allows the customer to buy what they need without having lots of figures that they do not. It does mean you have to buy three sets to get all the poses, but we are in favour of this approach and think most will like having the choice. In this case of course all these men would be few compared to the basic infantry, so unlike the traditional format customers can create large bodies of troops (from the other sets) without needing to buy large numbers of sappers, drummers etc. which are in excess of requirements. Command sets such as this always seem to have more of interest than ordinary infantry sets, and this one is no exception. We really liked all the figures, and all are accurate, at least as per regulations (or widespread practice where the regulations were disliked). Also with a little work many of these figures can be useful elsewhere, so there are many possibilities for this set. This is something like the icing on the cake when considered along with the other four sets of Napoleonic French light infantry for the period 1806-1812, and it wraps up the impressive coverage of this subject by HaT very nicely.